One of the real great things about working in the boating industry is the fact that one happens to frequently have to sail a boat. It´s part of the daily working life and I must say that´s the reason (no, it´s not money) why I chose to give up my convenient life (and high salary) of the marketing industry to pursue a career in boating. 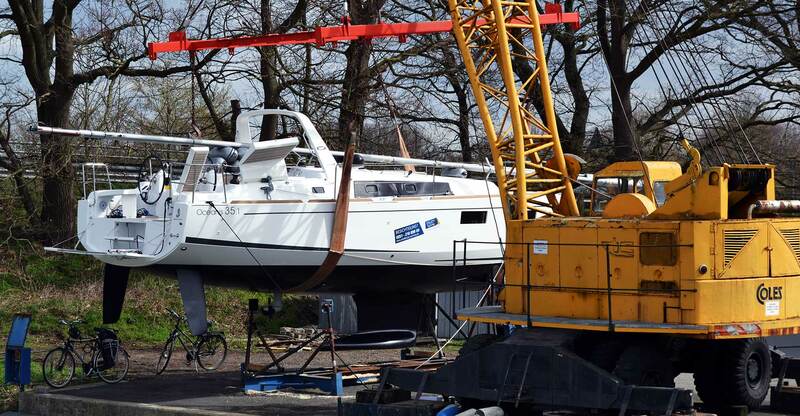 As it happens, it´s spring time again and our yachts have to be transferred from the winter-locations back to the seas. 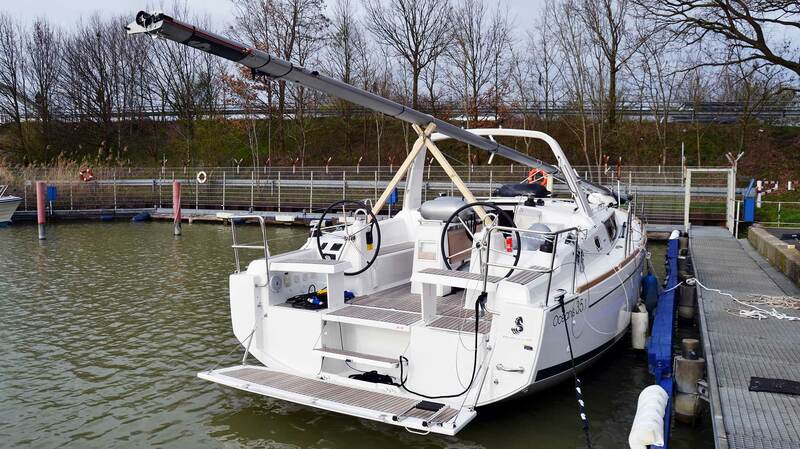 For one of our boats, a brand new Oceanis 35.1, this is a very interesting case. “My” Oceanis 35.1 is ready to be brought to the water again. The boat has been stored over the cold months in Muenster, which is a nice city of course, but it´s situated some 250 kilometres away from the North Sea. Why we chose this location? Well, prices are very low here and some of our team members use to be living near. Another reason is that Germany has a very, very dense network of channels and inshore waterways – a rich heritage from the decades of the industrialization when trade by waterways was the fastest way of moving stuff around. So, I am about to begin a series of articles here which hopefully will show you a very different kind of cruising – the inshore-style. But before we could set off for the some 180 miles trip from Muenster to Luebeck the boat had to be revived from the winterizing state. 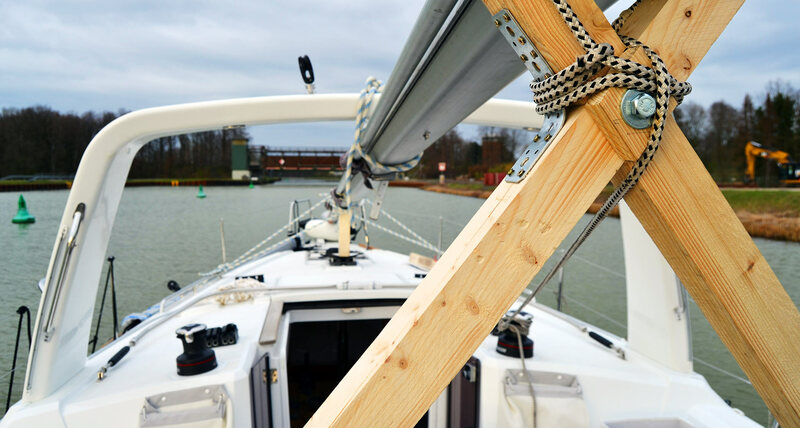 We craned the boat into the waters of the Dortmund-Ems-Channel after the antifouling was done and everything was checked carefully. On German waterways the maximum height of a boat passing under a bridge must not exceed 4.50 metres. That is why we cannot rig the boat ready to sail with the mast up and had to put it down on the deck. A makeshift solution (and a pretty stupid one too) was to put the heavy aluminium Z-Spars mast on fender right on the cockpit table. Unacceptable, since walking about in the cockpit was made impossible not to mention the shaky and pretty unsafe stowing of the mast. Let´s have some tool time now! 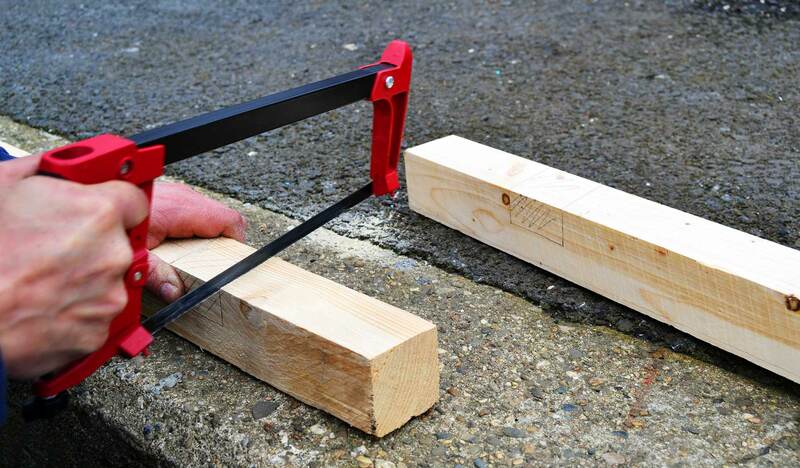 I went to the home improvement shop and bought two two metres pole of the cheapest timber and began to cut out some parts in a way that a cross was formed. This would make the mast support for the rear end. 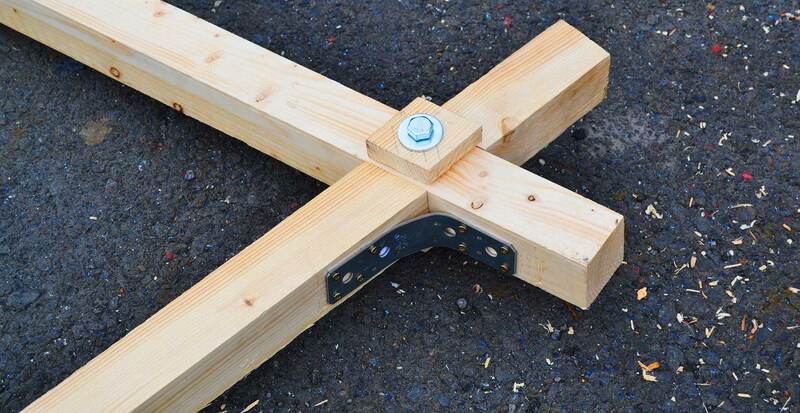 It took us a 12 millimetre bolt and nut to secure the cross and some additional screws to create lateral stiffness. I placed the support on the aft benches and secured them with ropes to the Genoa winches – another benefit: By winching the ropes I was able to secure the mast support very tightly. The inshore delivery trip will be lasting a long period of time, 5 days at least, so the aim was to make it as cheap as possible but as durable and solid as possible. Imagine a large inland watercraft passing you with 12 kilometres (the highest speed permitted here): It will create quite some swell. 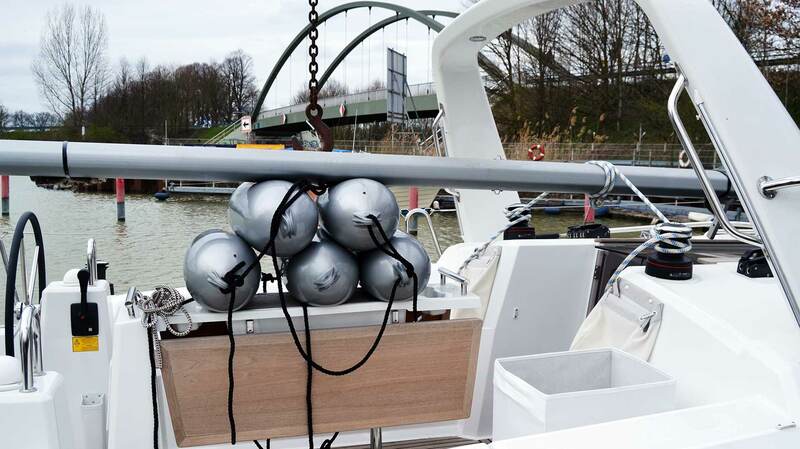 I just don´t want to get struck by an unsecured mast nor want I to have the boat damaged. In the end a day´s work paid off: When we put the mast on the deck of the Oceanis, we first secured the bow part on two old fenders to the pulpit. Then we had to pass the mast through the mainsheet arch and put it onto the newly built stand. That was a bit tricky since on the first trial the stand turned out to be too big. I cut off some 15 centimetres – it worked. But I judged that there was too much of flexing in the middle section of the mast which could not have been good for the material. Another pole was quickly measured and cut to size, again secured by some ropes so that the mast is now resting on three solid points and has been secured by a multitude of ropes. Nice work! Checking the boat I made a note to myself to not forget about the increased length over all of the Oceanis: The yacht has some 10.50 metres length over all but features now an extended “bowsprit” of at least 1.80 metres. 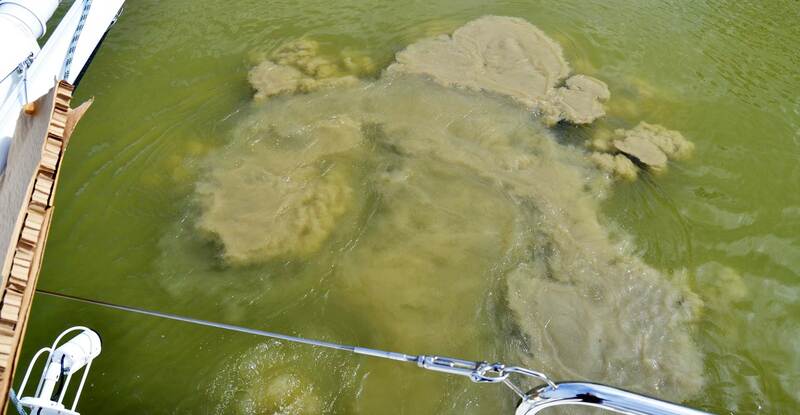 That´s crucial to bear in mind because inshore travel means locks. Quite a number of locks though! But behold of the increased length! Especially in locks. As the day was drawing to a close we had to leave the jetty. But behold, my colleague (one of the guys who lives here) told me that this harbour was too shallow even for the shallow draft of the Oceanis with her shortened keel. I couldn´t believe what he said but he was persistent in telling me that there was a bore just between the waterway and the jetty. So, what to do now? … flank speed ahead! The power boat made a jump forward as the engines got alive with a string roar, quickly reducing power, he just wanted to create a large push by the screws to “blow” some of the ground clay away. We repeated this manoeuvre a couple of times creating a large trail of muddy backwash, slowly but surely plowing a channel into the bore in front of the harbour. I´ve made it: Underway at last! 30 minutes later I started the Yanmar-Diesel aboard the Oceanis and we casted off. This time I was the skipper and my mate acted as my linesman. I turned the bow right on the bearing I managed to memorize and gave full power to the throttle. Of course, it´s different on a sailing yacht when you go flank speed, but however, even the “just” 30 horsepower of the Oceanis pushed the boat quickly to 7 knots. And, of course, we managed to reach the deeper waterway without any trouble. The boat is now in a Marina not far from our winter storage, awaiting me and the transfer crew (which consists of just another mate). Back home I switched on the computer and did the math. As skipper, no matter if inshore or offshore, I want to show good seamanship and thus I am planning the trip well in advance. It will be a beautiful trip: Going North-East via Hannover into the Elbeseitenkanal, which is still one of the busiest waterways of Germany, we will then eventually reach the River Elbe on which we won´t stay for too long. A quick turn South and then slipping to the Elbe-Luebeck-Waterway, another set of miles (and the most exciting ones!) 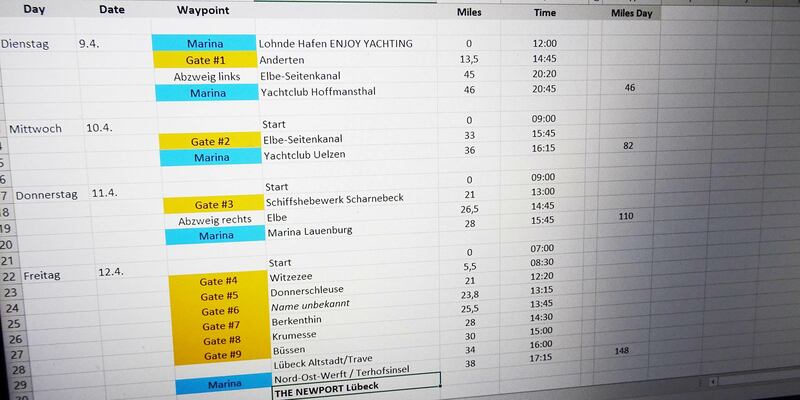 will then bring us to my home town where the boat will then be rigged and sailed through the Luebeck Bay to her berth. That´s some 150 miles under engine, 8 locks and one big ship lift to which I am looking forward to the most. The trip will be lasting for 5 days, as it is planned now, and I hope so much that we will be provided with nice sunny spring weather. 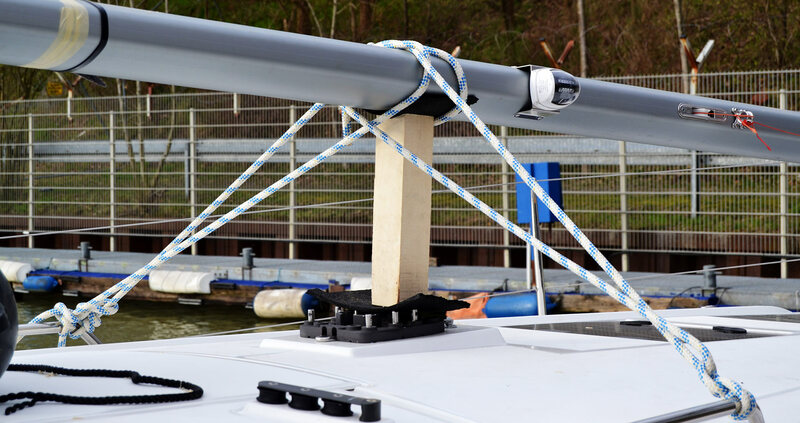 So you guys can be looking forward to a series of inshore delivery articles dealing with inshore-travel, how to get your boat through locks safely and professionally and hopefully about some interesting maritime destinations – in the middle of Germany. Stay tuned!